When I was a kid, the highlights of my kid-year involved taking turns with my 4 brothers to sleep over my Grandparent's house on weekends. My Nana & Papa spoiled us like 6 week old milk. The ONLY requirement was we had to attend Mass on Sunday. Finding myself bored stiff, I would often engage in conversation with another kid, an elderly person or with myself. To cut through the monotony, I might do jumping jacks on the pew or aim spitballs to the back of parishioner's heads. My Grandmother would look at me with a death stare (all bark no bite) and whisper yell, in Italian, "mantenere ancora, statti zitto!" When I would ask my Papa what that means, he would say "keep still". One day I learned it means "keep still and shut up." Which brings me to this concept of "go to Gemba, show respect". I find it helpful to be very mindful of my Nana's advice. Mantenere ancora, statti zitto. Let's take a look at both components of this wisdom. First, keep still. It AMAZES me how many times we can look DIRECTLY at crummy processes and not see crummy. It is not easy to actually SEE problems, unless you keep still. Taiichi Ohno's famous "circle" was designed to help young engineers quiet their mind and learn to see. The "circle" was drawn on the floor and Ohno would instruct a young manager to stand in the circle and just watch. For hours and days. When we quiet the mind and understand how the process SHOULD work and compare it to what we see with our eyes, we begin to see problems. When you go to GEMBA, keep still. You don't go to GEMBA to be a hero and fix things, we go to learn to gain a much deeper understanding of what is happening. Then there's "statti zitto". One of the most important ways to demonstrate respect for people is to learn how to listen. Many managers just love to hear themselves talk. Humble inquiry is a way to get people to open up, give you their ideas and thoughts. Sounds simple, all you need to do is ask open-ended questions (not questions that can be answered with yes or no (those are questions you ask to confirm what you think). Respect for people is the belief that the people who actually DO the job every day are the true experts. It is tough to learn anything new if we already have all the answers when we show up. 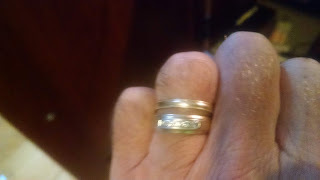 The picture above: the bottom ring on my right hand is my wedding band. The top ring is my Nana's wedding band! I've been wearing it since she passed away in 2004. It is a great constant reminder for me to "mantenere ancora, statti zitto!" when I show up at someone else's GEMBA!